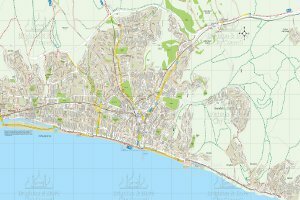 Bevendean Down is a cluster of species-rich chalk grassland, scrub and woodland sites which have earned Local Nature Reserve (LNR) status and is in the South Downs National Park. The sloping hills are home to many species of butterfly including the nationally scarce Adonis Blue, the rare Silver Spotted Skipper and a large population of Round-headed Rampion (otherwise known as the Pride of Sussex). Sheep have completed their grazing on Bevendean Down and will be back next winter. If you are interested in helping the rangers check the sheep by becoming a "lookerer" please contact us. 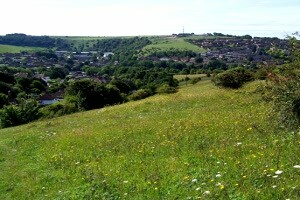 Hog Plantation, part of Bevendean Down Local Nature Reserve, was converted from farmland to traditional grassland in 2006 as part of the Downland Initiative. The farmer works with the council for the benefit of plants and butterflies which are locally and nationally rare. The fields are grazed by British White cattle which keep the scrub at bay and help the restoration of these rare species. There is more information about local wildlife on our City Wildlife website. Please be sure to follow the Countryside Code when moving through these areas. The 49 and 49A buses stop nearest the site. Further information and timetables available from the Brighton & Hove Bus company. There is limited on-street parking available.